Dive against Debris is an international volunteer network and online reporting platform to map and visualise the scale of the waste in the oceans. 21,000 divers across 60 countries have loaded data and images of 400,000 items of trash they’ve removed from the sea since 2011 in an effort to educate the public and policymakers about the true scale of the problem of trash. The site and campaign are coordinated by global scuba ocean conservation movement Project Aware, which sees it as an area where scuba divers are uniquely positioned to effect real change. The site gives divers all the resources they need to contribute to the global underwater survey: there’s a survey kit to train you on data-collection protocols, Action Maps where you can either promote or find out about dives near you, and event organiser tool-kits. 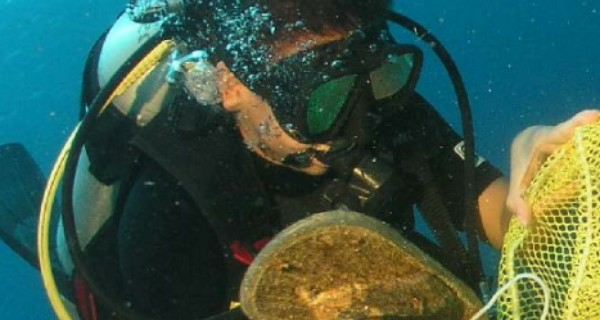 Divers upload information into a global database that will feed into campaigning and policymaking initiatives (so far, for example, the site has demonstrated that 66% of debris divers collect is plastic). You can also share your story on the My Ocean website, through which you can report your experiences and findings, and inspire more people to remove more debris.